I made pancakes for my kids’ breakfast this morning, but the hubby and I wanted something heartier. 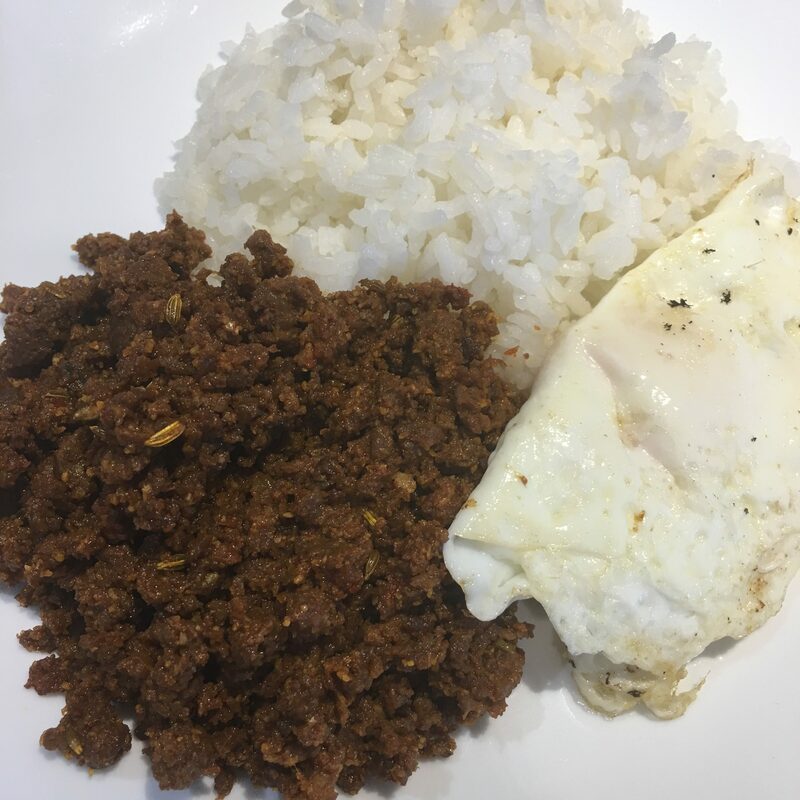 Here’s my version of homemade chorizo. 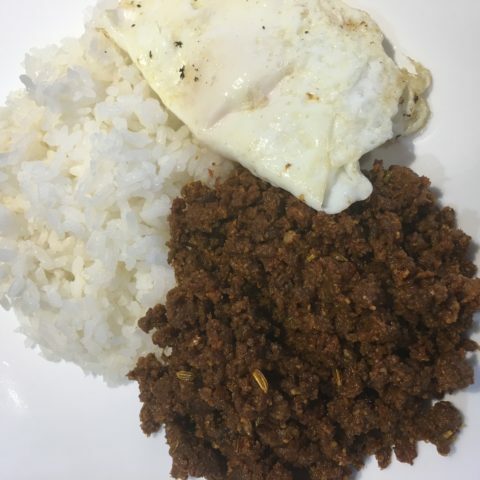 It’s delicious with eggs and rice! 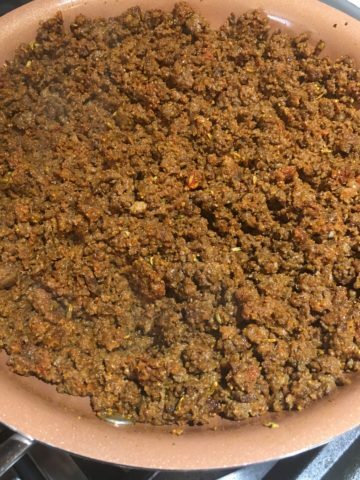 Brown the ground beef and drain off excess fat. Add all the remaining ingredients. Stir to mix well. 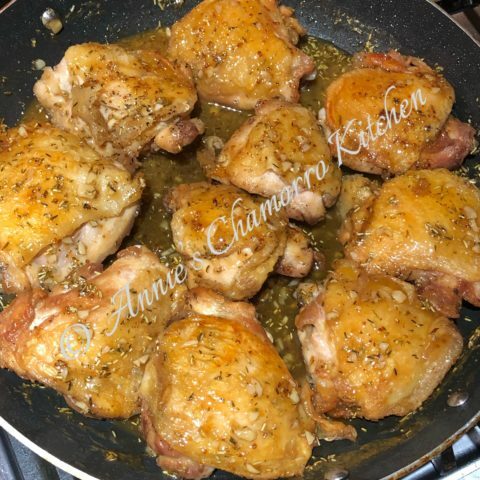 Cook an additional 5 minutes. Add more hot pepper to taste. Serve and enjoy! I especially love this with hot steamed white rice and a fried egg. 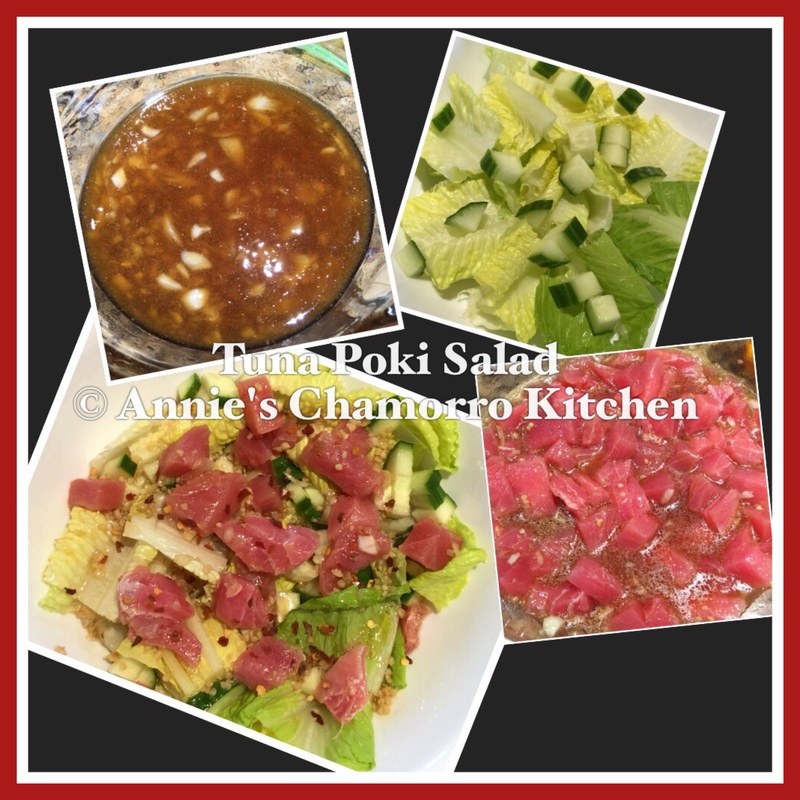 *I also added 1 teaspoon fennel seed, and 1 teaspoon ajinomoto, but this can be omitted. 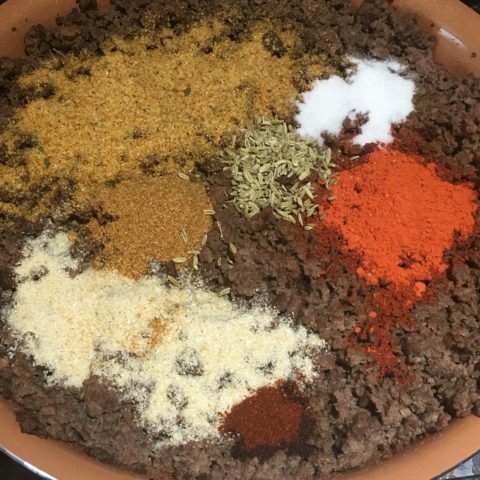 Add all the remaining ingredients. Stir to mix well. 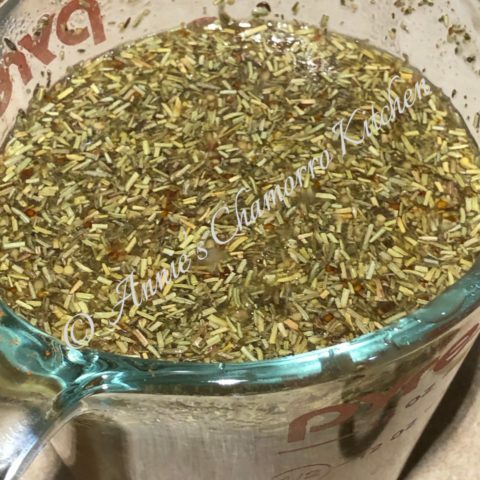 Despite all that, I’ve been accumulating a lot of recipes to share, so be on the lookout for new posts. 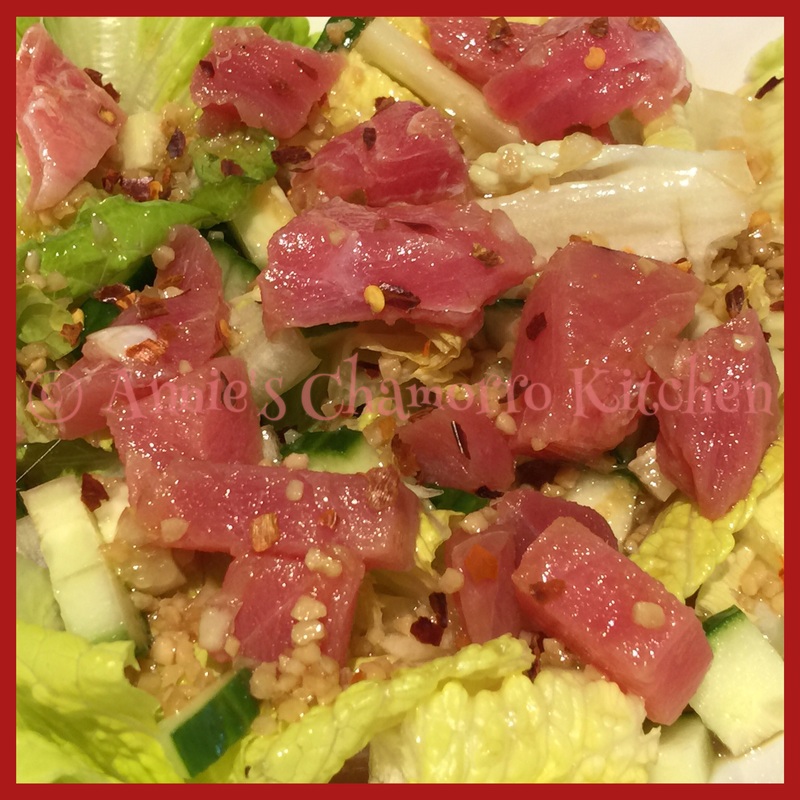 This is the first of many new favorites that I’m sure you’ll enjoy as much as my family does. 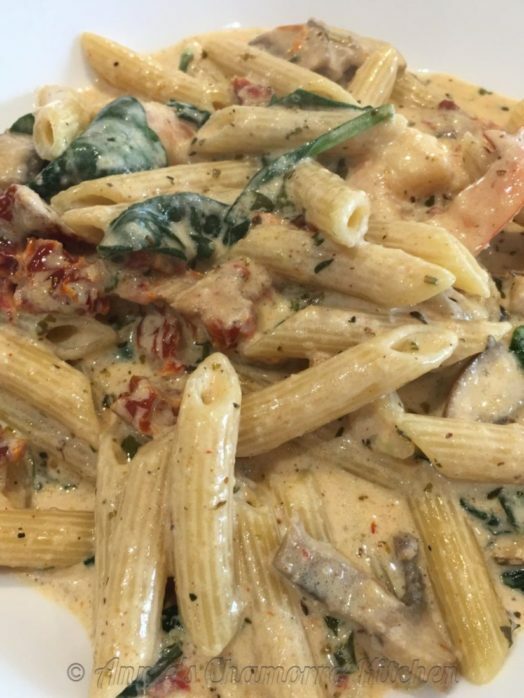 As you probably know from some of my other recipes, my family loves pasta. 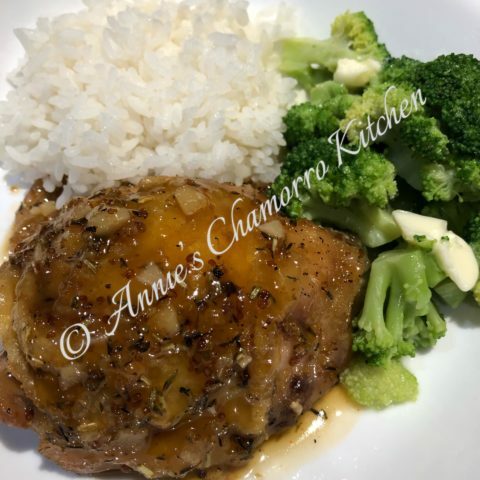 This is a super easy dish to make. 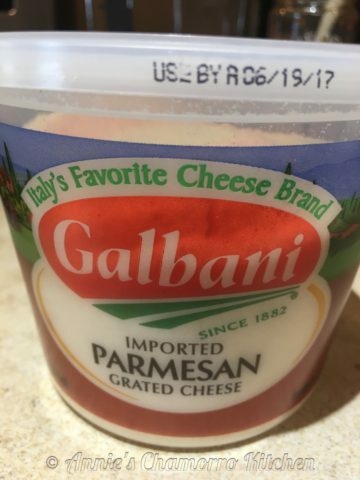 While we love traditional spaghetti sauce, I love making a sauce using cream, sun-dried tomatoes, and Parmesan cheese. 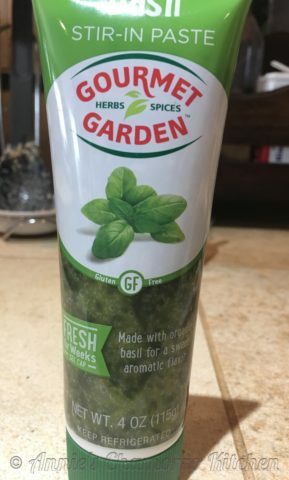 You can add a variety of other ingredients such as mushrooms, basil, and spinach leaves to take it to a whole new level. The possibilities are only limited by your imagination. 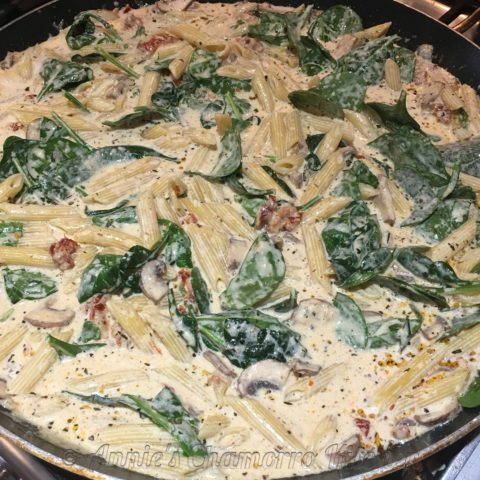 I added baby portobello mushrooms, basil paste and fresh spinach leaves to this recipe. 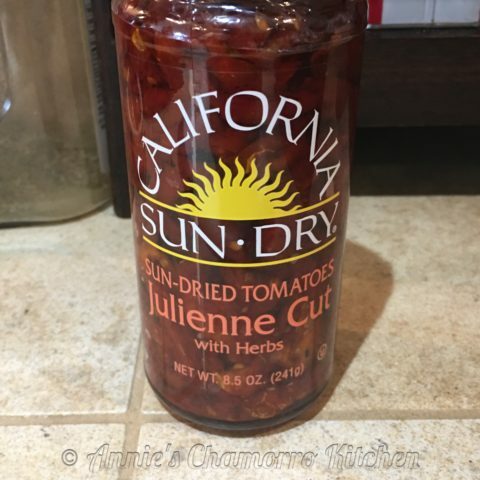 See below for the type of sun-dried tomatoes I used. I use the ones packed in oil. 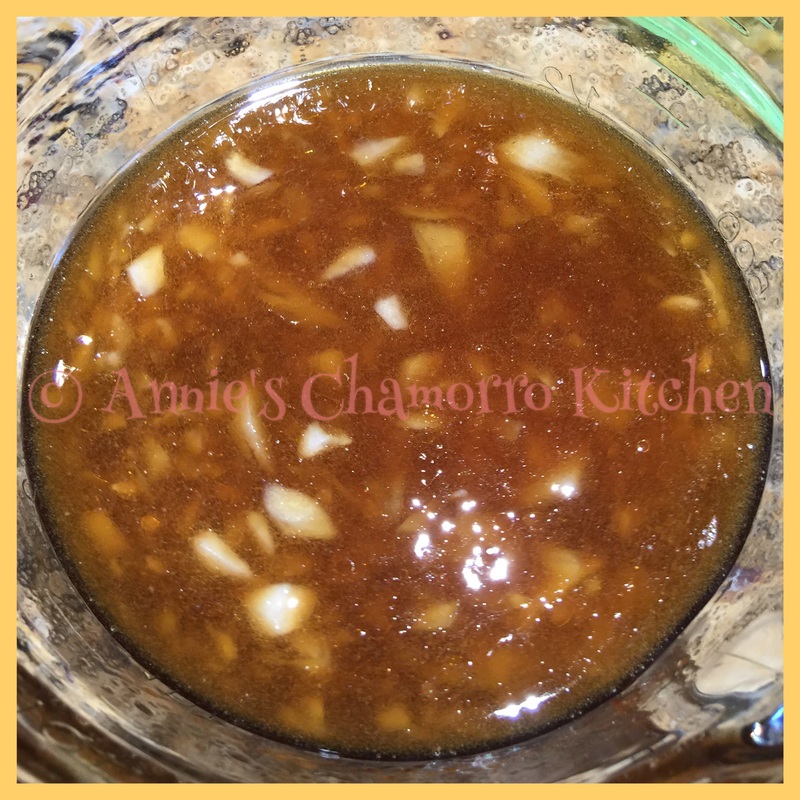 I use the flavored oil to saute the mushrooms, which enhances the flavor of the whole dish. 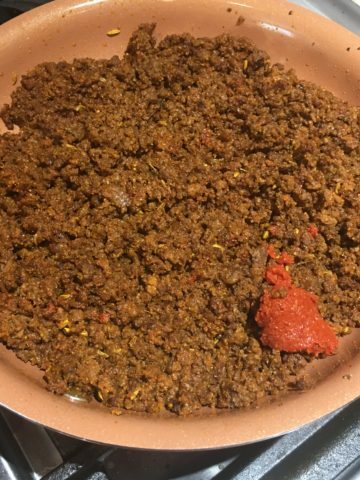 If you’re a follower of my recipes, you know one of my signature ingredients is a powdered beef seasoning called Dashida. You can find this any Korean market (or most Asian markets). 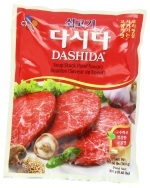 If you can’t find Dashida, use beef bouillon, or add salt to taste. 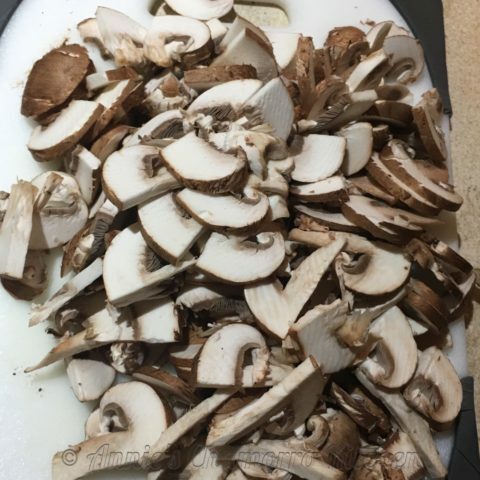 Start by slicing the mushrooms. Set them aside for now. 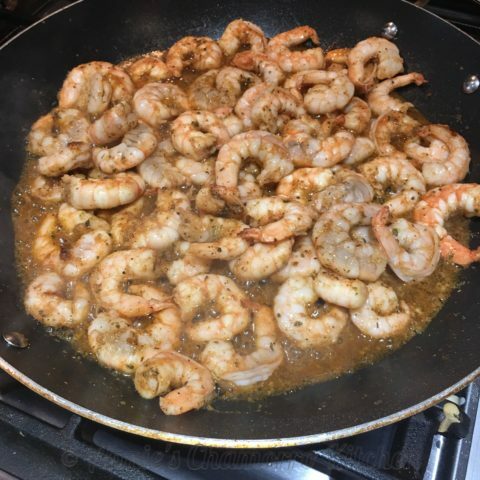 In a LARGE skillet over medium high heat, saute the shrimp with the seasonings (see my full recipe below). 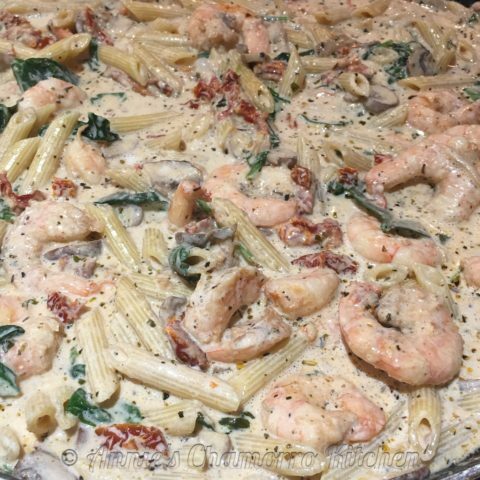 I use a 17-inch skillet; if you don’t have one this large, you may want to use a large pot as we make the sauce and add the pasta and shrimp all together midway through. Set a pot of water to boil while you prepare the shrimp. When the water is boiling, add the pasta to the pot (you can a couple of teaspoons of salt to the water as well). Only cook the pasta partway, about half the recommended cooking time suggested on the package. The pasta will finish cooking in the sauce later, so you want to make sure you don’t overcook it now. Cook the shrimp for about 5 minutes, stirring to ensure even cooking on both sides. 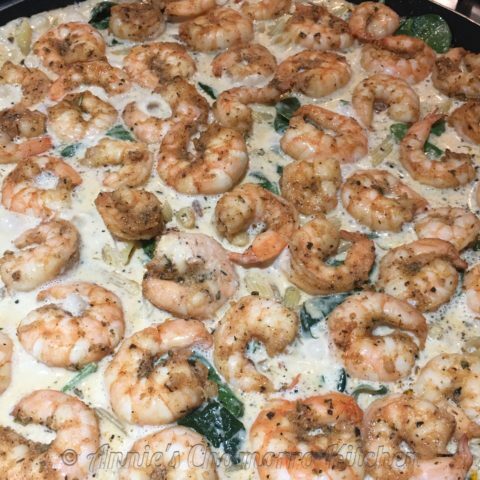 Remove the shrimp from the pan and set them aside for now. 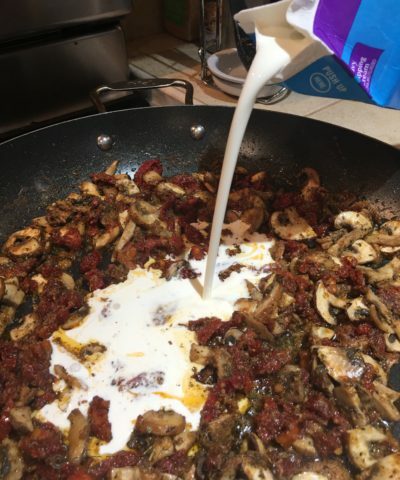 To the same pan, add the mushrooms and some of the oil from the sun-dried tomatoes. 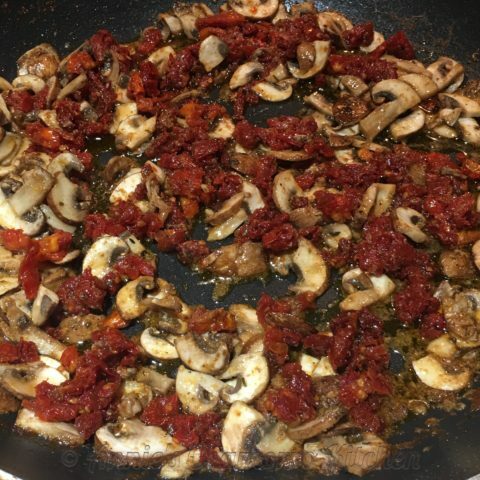 Cook the mushrooms until they reduce in volume, then add the sun-dried tomatoes to the pan. Cook for another 2 minutes or so. Add the remaining seasonings to the pan as well as the heavy cream. Add the grated cheese to the pan. Stir to combine all the ingredients. The pasta should be ready by now. Drain the pasta then add it to the sauce. 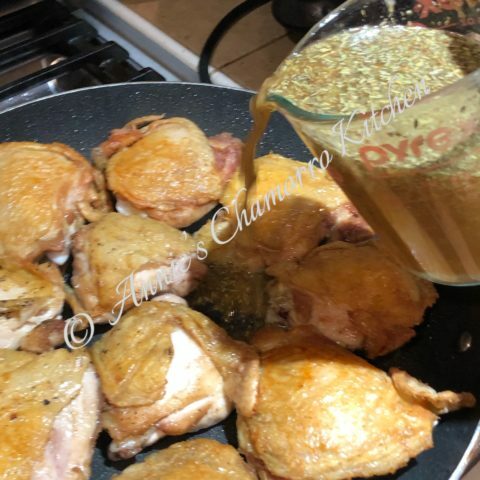 Add the basil paste and spinach leaves to the sauce. Add the shrimp and any liquid that may have accumulated in the dish back to the pan. Stir to get all that delicious shrimp mixed in. Cook for a minute or two to reheat the shrimp. 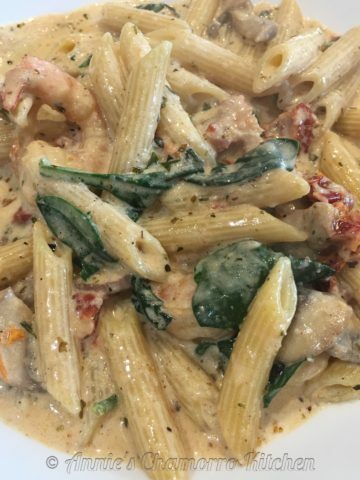 Oh my….are you drooling yet? In a large skillet, saute the shrimp with seasonings. 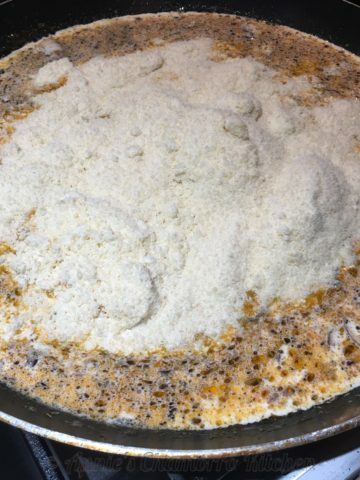 Cook over medium high heat for 5 minutes. 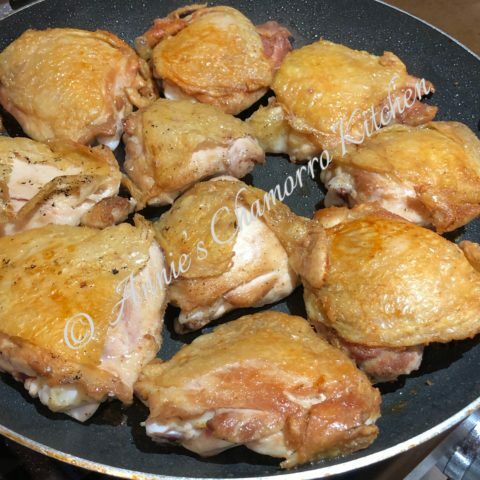 Remove from the pan and set aside. Place a pot of water to boil according to the instructions on the box of pasta. 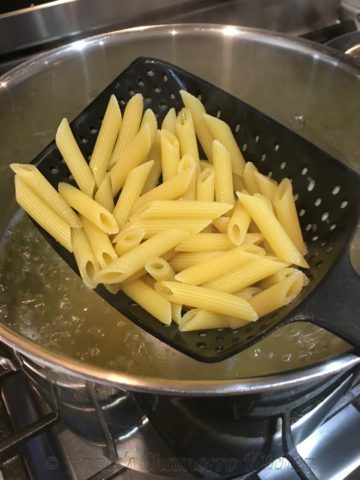 Cook the pasta for half of the recommended cooking time. 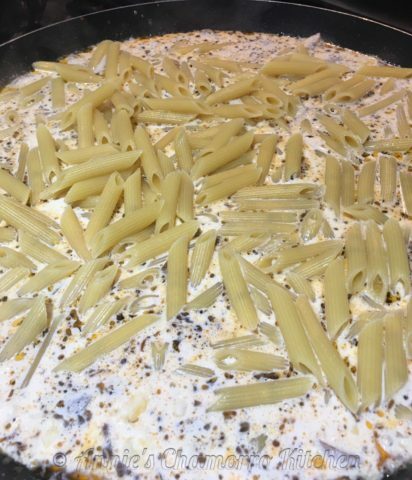 The pasta will finish cooking in the sauce. 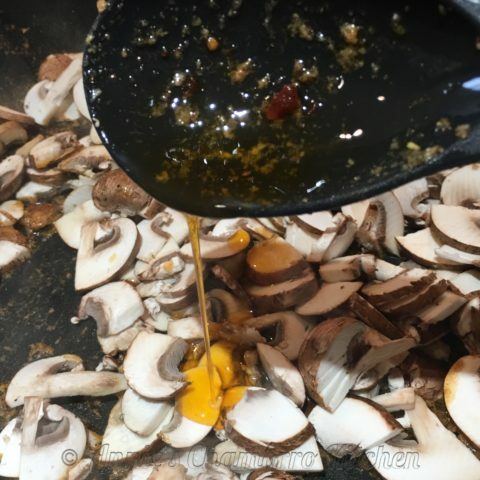 Add the mushrooms and sun-dried tomato oil to the same pan used to cook the shrimp. 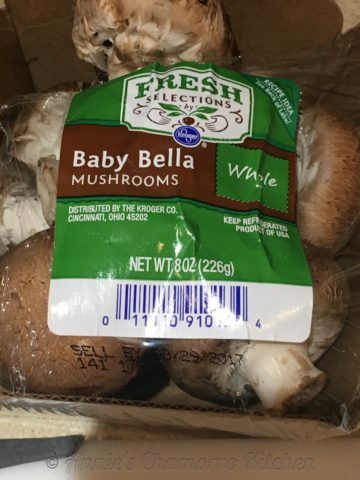 Cook until the mushrooms soften and reduce in volume. Add the chopped sundried tomatoes. 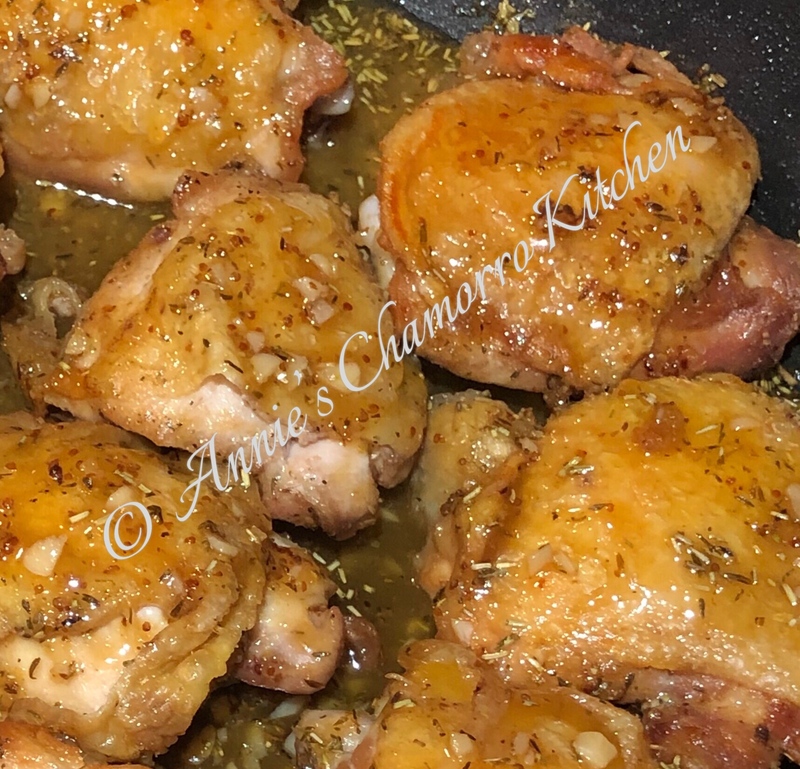 Cook an additional 2 minutes. 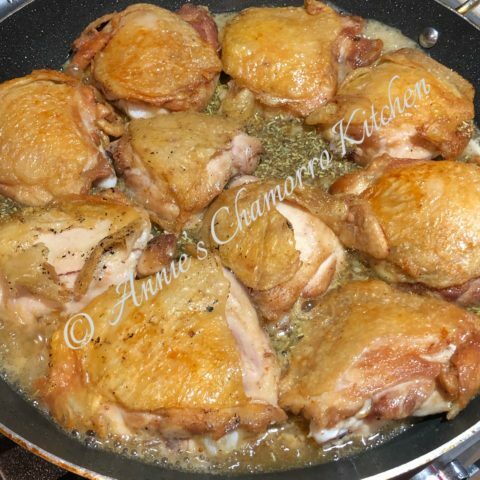 Add the remaining seasonings to the pan; stir to combine. Pour in the heavy whipping cream. Add the partially-cooked pasta to the sauce. Turn the heat back up to medium-high. 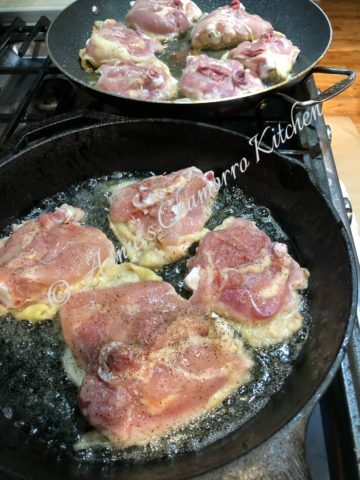 Cook for a few more minutes, just until the pasta is done. 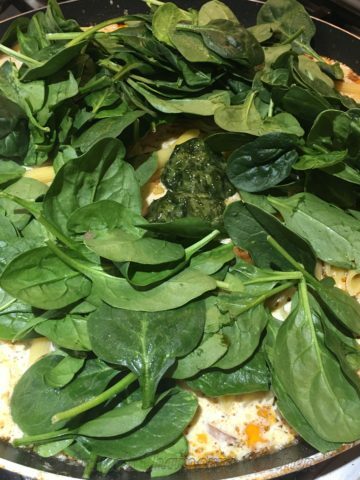 Add the basil paste and spinach leaves to the pan. Stir to combine. Add the cooked shrimp to the pan. Stir to combine. 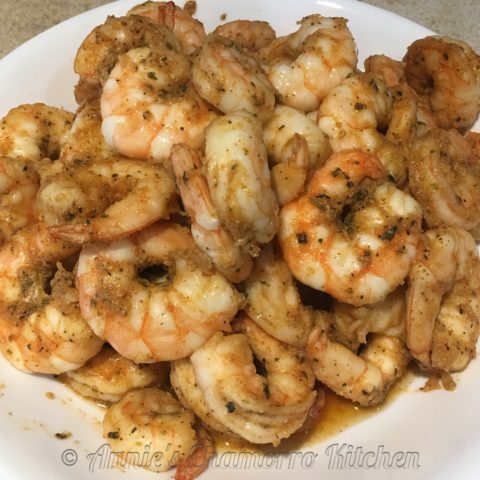 Cook for 1-2 minutes to reheat the shrimp.